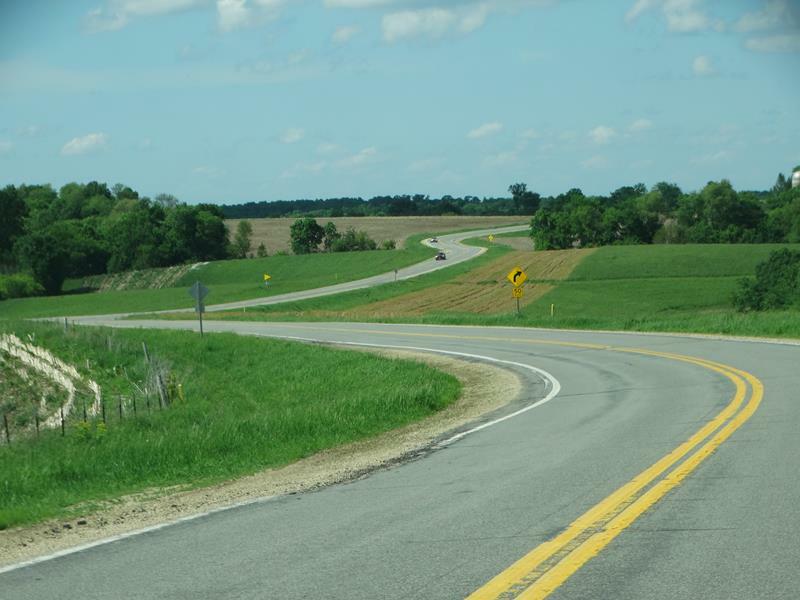 Quickie Summary: State “Trunk” Highway 95 is a beautiful tour of western and central Wisconsin in the Driftless Area. From the picturesque Great River Road/Highway 35 junction in Fountain City up, down, and across occasionally rugged terrain and majestic viewpoints through towns like Arcadia and up to The Highground in Neillsville, Highway 95 provides a look at the state’s dairy industry, furniture-making centers (Arcadia’s Ashley Furniture) and saluting our military at the Highground. 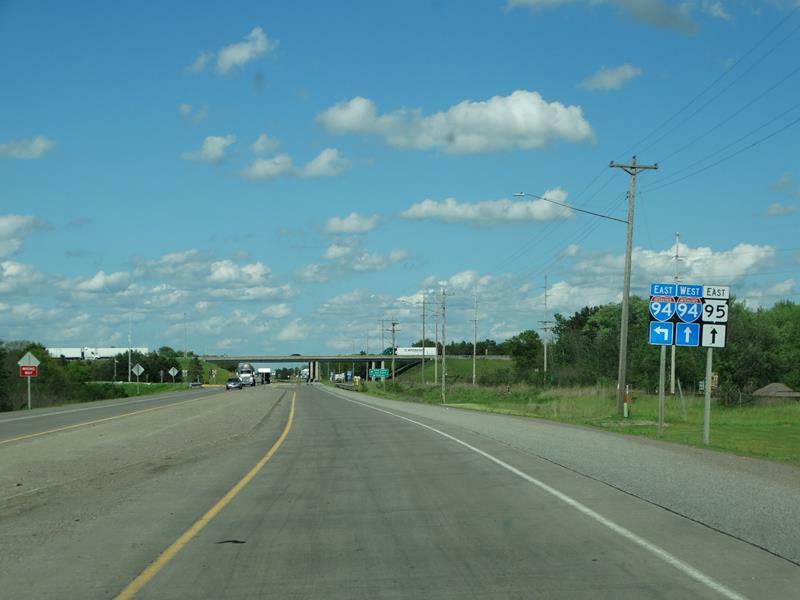 Highway 95’s western terminus is right by the Mississippi River at Highway 35. A winery, a brewery, a few museums, bluffs, and great views abound. 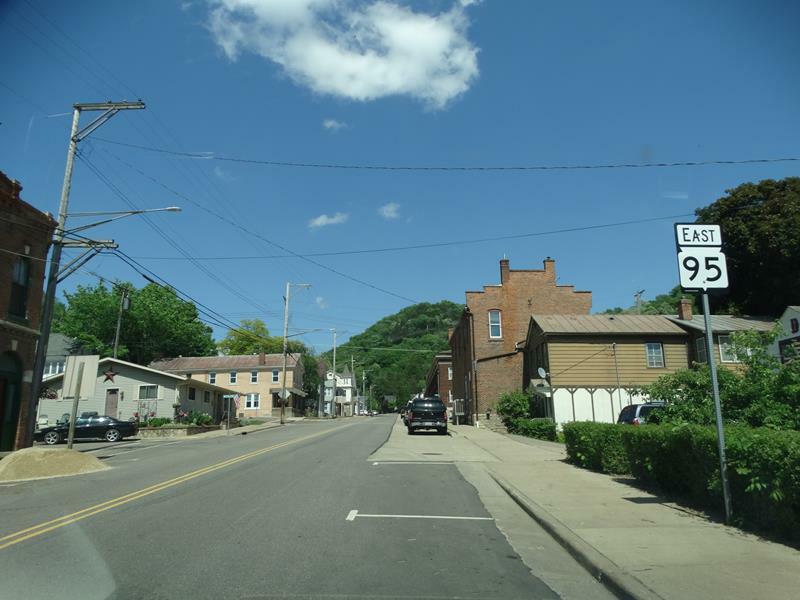 The Drive (West to East): Highway 95 starts in beautiful little Fountain City (pop. 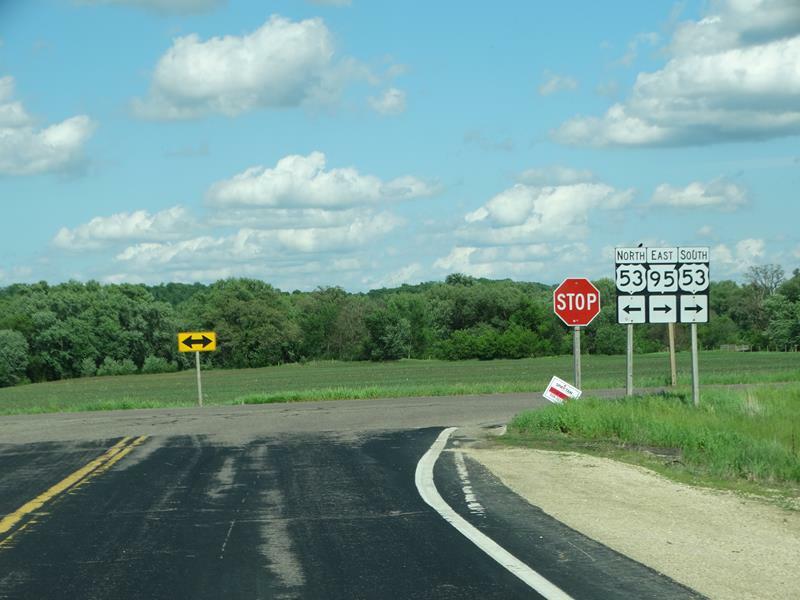 859) at Highway 35 – also the Great River Road – in Buffalo County. The Mississippi River itself is within eyeshot, just across the railroad tracks and down an embankment. 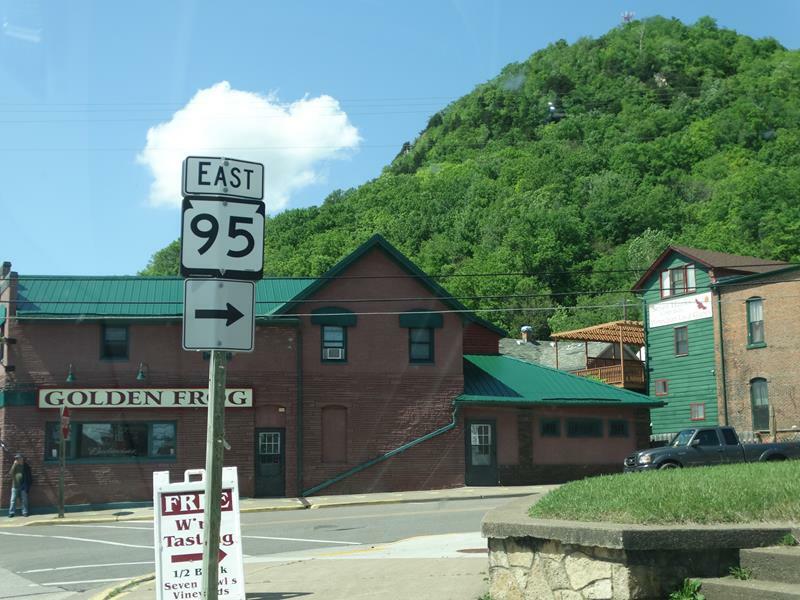 Highway 95 eastbound corner, right at the Golden Frog. Looking toward the western end of Highway 95 at the Great River Road, Highway 35. The river itself is right there. 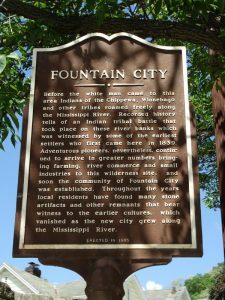 Fountain City started as Holmes’ Landing, having been a popular stop for riverboats as far back as 1839. 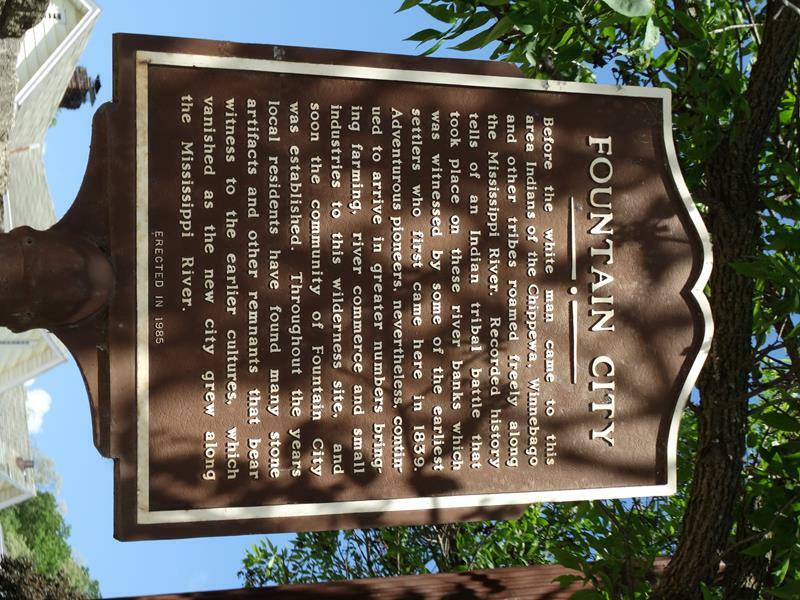 Fresh water from nearby springs that were popular with the Mississippi River crews helped lead to the name of “Fountain City.” The town is nestled up against Eagle Bluff, one of the tallest along the river; that helps keep Fountain City narrow in places – some areas are only about three blocks wide. The beauty of this area has long drawn artists. Just north of town near Cochrane you’ll find the Prairie Moon Folk Art property that farmer-turned-folk-artist Herman Rusch turned into a roadside wonder featuring over 40 sculptures; a few remain but much of its original pieces were sold off long ago. 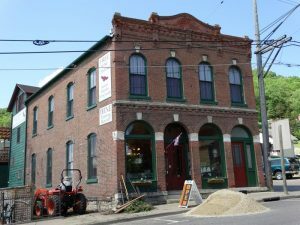 But in town, you’ll find little places like the Fountain City Folk Art Center and a little historic museum detailing the colorful history of the town. 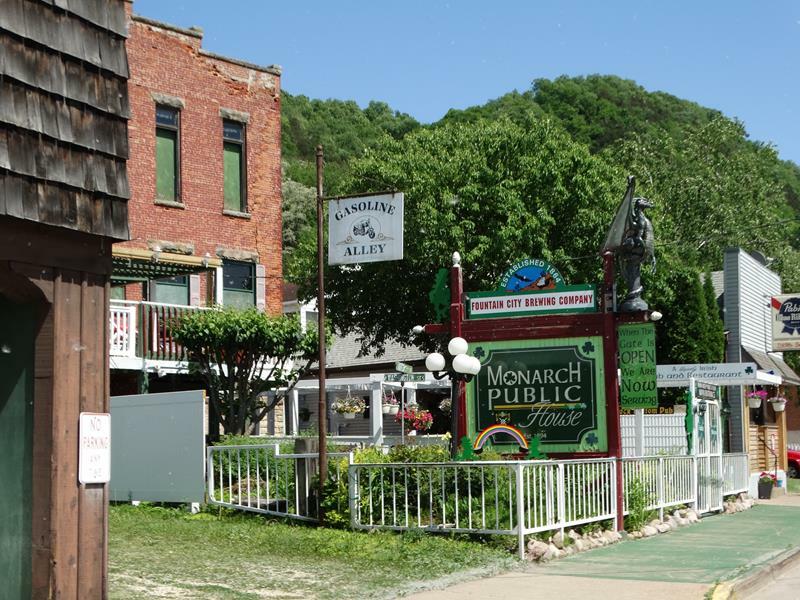 The Monarch Tavern & Public House is one of the oldest taverns in Wisconsin and former home to Fountain City Brewing Company, which lasted until 1965 and traces its roots – on this very location – to 1856. They still micro-brew some original brands like Fountain Brew and several other styles. The original Fountain Brew came back in 1997; an original assistant brew master, Wilbert Schmitt, saved historic brewing records and approved the resurrected Fountain Brew recipe. So now, you can try it for yourself. Eagle Bluff towers behind Fountain City’s Monarch Public House, which dates back to the 1896. Highway 95 begins a few hundred feet north of here. 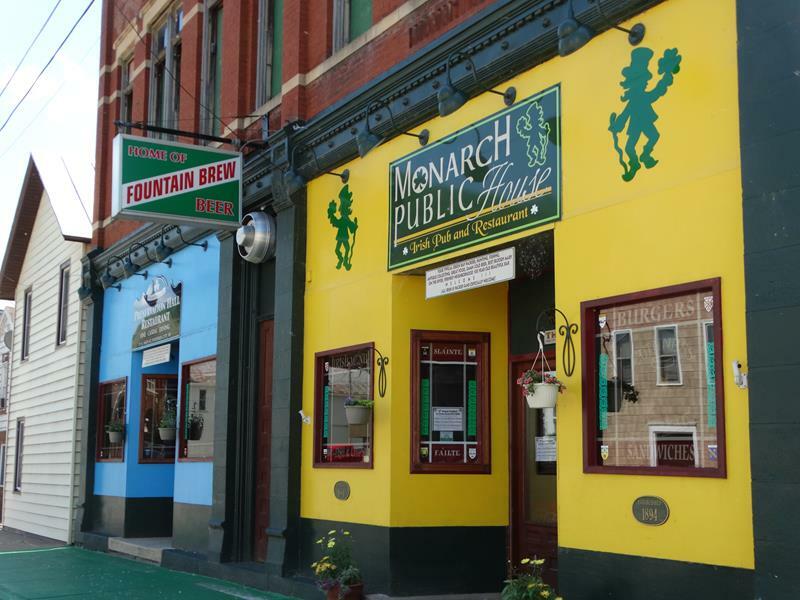 The colorful front of the Monarch House, home to Fountain City Brewery. Highways 35 and 95 meet here. As it turns out, the bluffs hugging Fountain City can also serve as good vineyards. Seven Hawks Vineyards is one of the more extensive in the Midwest; they create a variety of red and white wines completely out of locally-grown grapes. You can sample them for free right where Highway 95 begins, one block north of Highway 35, at the Seven Hawks Wine Bar & Tasting Room. Outside, a classic old brick structure. Inside, some great wines from grapes grown on nearby hills. Two other roadside attractions make Fountain City a good stop. One is Rock in the House, which sits along 35 several blocks north of Highway 95. 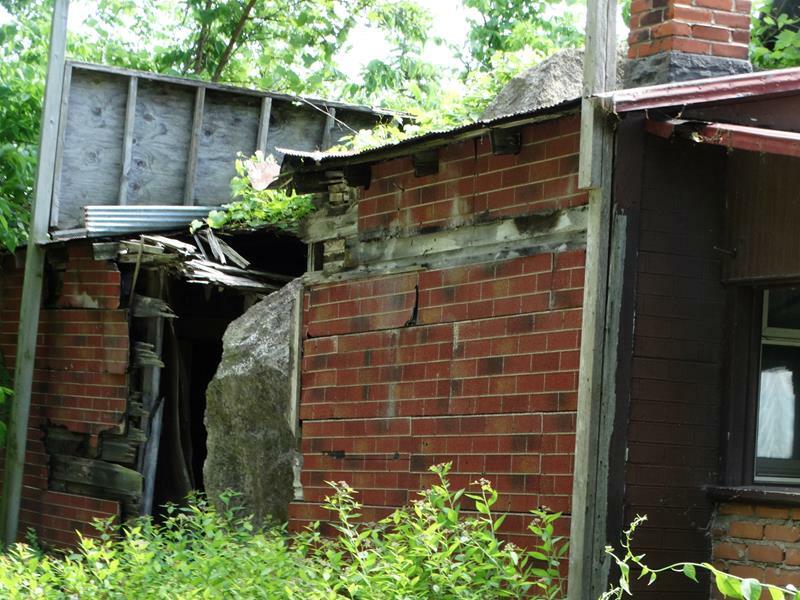 Not to be confused with House on the Rock, this is a small dwelling that just happened to be in the path of a 55-ton boulder that was careening down the bluff in 1995. The rock crashed into a bedroom, where it stayed. Its occupants, Dwight and Maxine Anderson, escaped unharmed but freaked out and they sold the house to John and Frances Burt, who turned the house into a museum that preserves the rock. Hey, it’s not like they can move it. When a rock rolls into your house like that, let others buy it and open a museum. Just up Highway 95 from “downtown” Fountain City working your way up the bluffs, you can detour briefly to Elmer’s Auto & Toy Museum. Elmer Duellman started collecting pedal cars in 1971 just because he’d never seen one before; now you and him can gaze upon over 500 pedal cars and 100 pedal tractors. The Museum, which officially started in 1994, also features antique metal toys and some classic cars like a 1929 Olds Woody, a 1929 Ford Phaeton, a 1955 Packard, and even the car in which he met his wife, a 1958 Chevy. So basically, there’s a lot to see in this little town where Highway 95 begins. As you work your way upward and onward from Fountain City and the Mississippi River, lovely vistas await. You’re heading through – and over – a variety of terrain in Wisconsin’s increasingly famous Driftless Area. Onward from Fountain City and up the hills! The temptation to take photos along this stretch of Highway 95 lies everywhere. Most of this stretch runs the crest of the Fountain City Ridge, which averages about 1,200 feet in elevation – often several hundred feet above your surroundings. Especially on a clear day, you get quite a few nice long-range views of the terrain. This is pretty much the rest of your ride along Highway 95 in Buffalo County – have your camera ready! There are no real towns along the top of this ridge; just farms, homes, and the occasional bar. And plenty of photo ops. This area is just ridiculously gorgeous. Highway 95 zigzagging along Fountain City Ridge in Buffalo County. Roads intersecting Highway 95 along this stretch have some interesting names, like Pansy Pass and Pretzel Ridge Road. 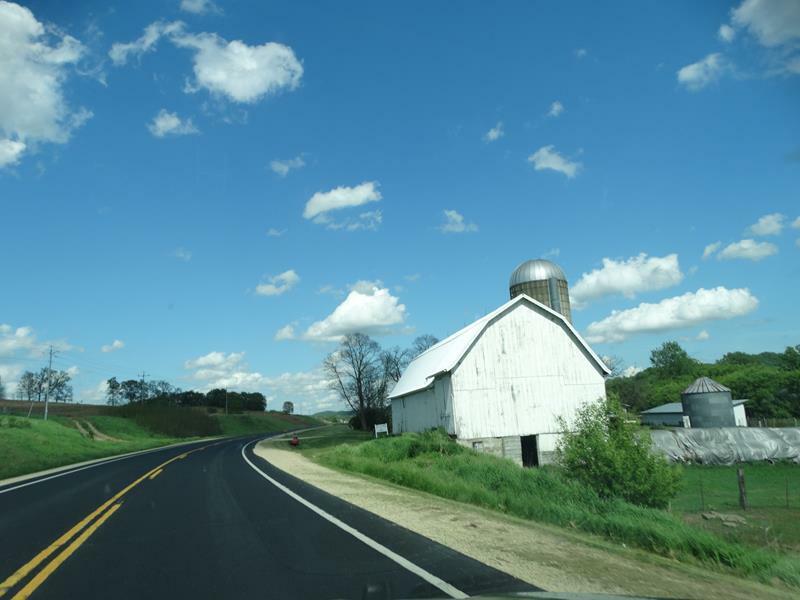 After all this rural beauty, Highway 95 heads County C near Swinns Valley, straightens up a bit and heads into Trempealeau County where it quickly enters this lovely county’s largest city. 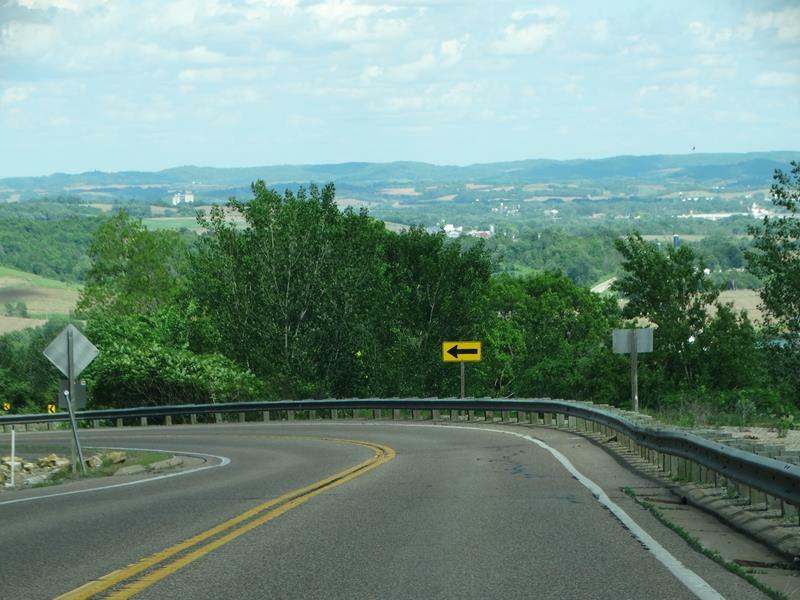 Highway 95 corkscrews its way down Fountain City Ridge into Trempealeau County as it heads towards Arcadia. 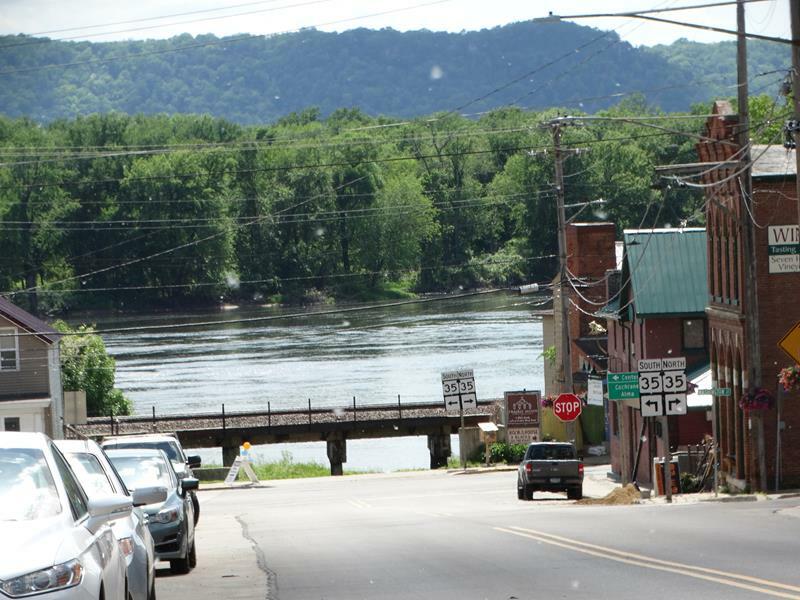 Trempealeau County’s largest city isn’t even all that large; with a population just surpassing 3,000 by recent estimates, Arcadia is also the largest city directly along Highway 95. While a small town, it’s well-known as the world headquarters of Ashley Furniture Industries, Inc. Ashley moved its HQ here from Chicago in 1982 and employs more people than the town has residents, meaning there’s a lot of commuting on the local roads. The headquarters campus lies just east of Highway 95’s Trempealeau River crossing in Arcadia, the first of four crossings of the river for this road. Arcadia also features Soldiers’ Walk Memorial Park, which at 54 acres is the largest Veterans’ Memorial Park outside of Washington, DC. This park is the site of Ashley for the Arts, an annual art and music event that hosts national, regional, and local acts and performers of all kinds along with artists displaying their wares and activities a’plenty for the over 10,000 attendees every August. You’ll find the park a few blocks south of Highway 95, via St. Joseph Avenue or Pearl Street. Highway 95 rolling through Arcadia. Arcadia also features a Carnegie library, the Arcadia Free Public Library, opened in 1906. This lovely Classic Revival building still serves as Arcadia’s main library, with the high school and elementary school in close proximity. You’ll find it right along Highway 95/Main Street. On the eastern side of town, Highway 95 intersects with Highway 93, the main north-south road in the area and a key connector highway between La Crosse and Eau Claire. This section of Highway 93 north of 95 opened as an “eastern bypass” of Arcadia that around 1984, as 93 originally came in via County A, joined 95, and then headed south along its present alignment. One might guess the bypass opened shortly after Ashley Furniture established their headquarters in town, anticipating more truck traffic. And yes, you’ll find plenty in this area, especially trucks with “Ashley Furniture” on the side. An Ashley Furniture Home Store is, in fact, just south of the 93/95 intersection. Continuing east from Arcadia on Highway 95, you’ll head up into the hills again and along more coulees. 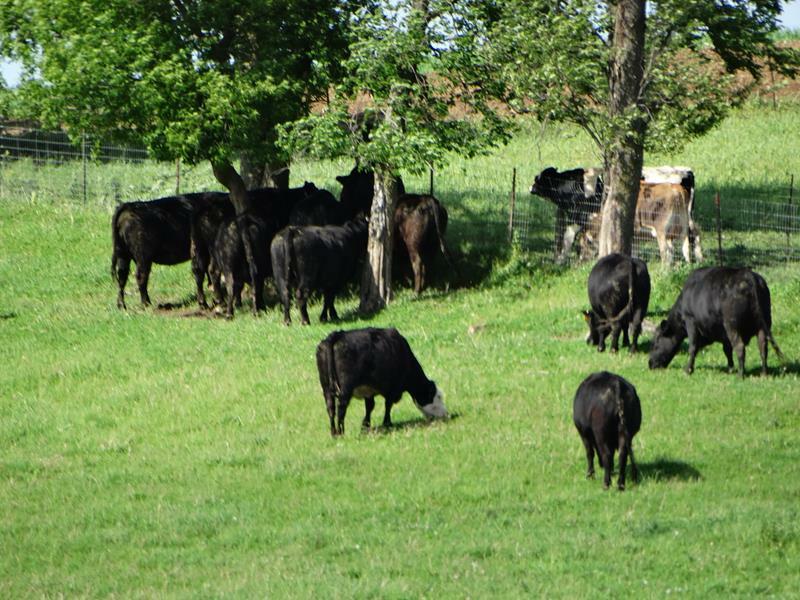 You’ll see many picturesque farms and hunting lands; this area is very popular for deer, turkey, and pheasant hunting, with the Lakes Coulee State Wildlife Area offering 808 acres of public hunting grounds on both sides of the highway, along with a Class III trout stream for fishing. 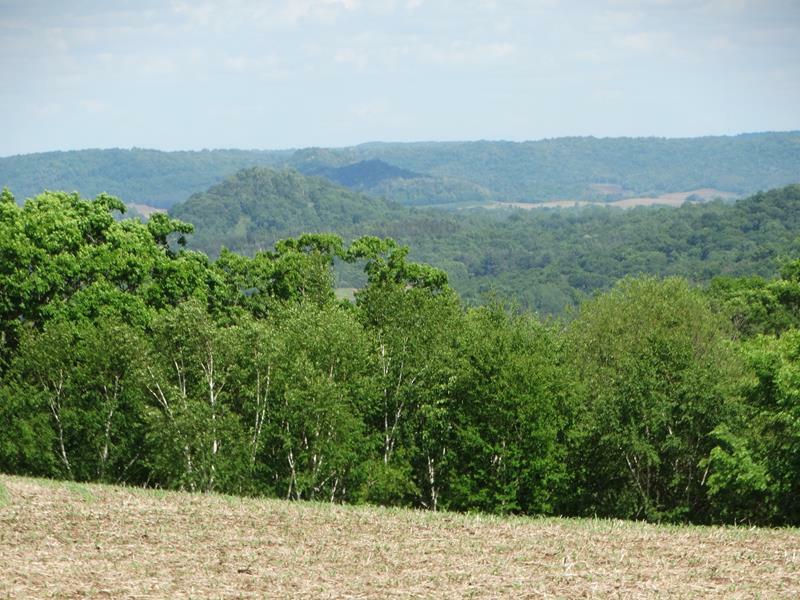 As you ascend and descend this part of the Driftless Area hills, lots of long range views show up once again before you meet up with U.S. 53. 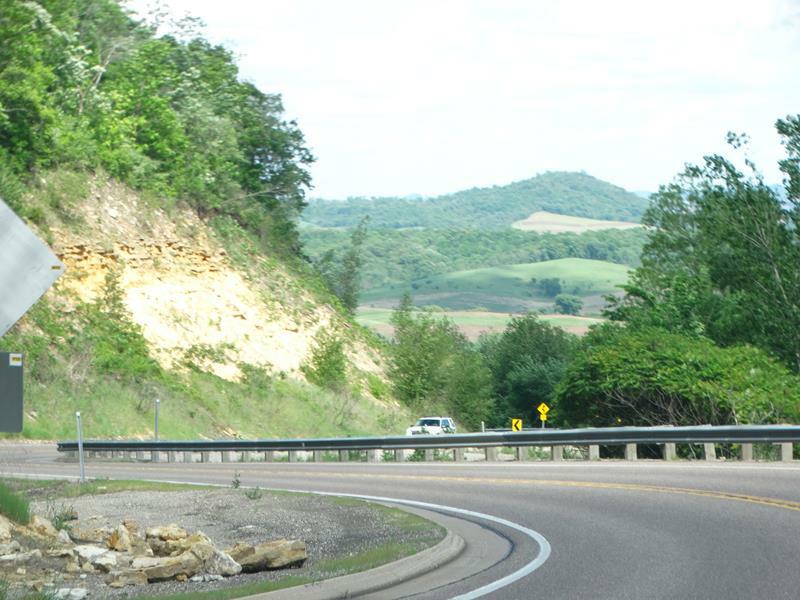 Highway 95 meets up with U.S. 53 just outside Blair in Trempealeau County. 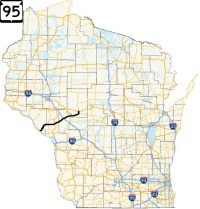 U.S. 53 is one of the other main routes between La Crosse and Eau Claire (Highway 93 and I-94 being the others), and Highway 95 joins U.S. 53 along its southern direction for a few miles into Blair (pop. 1,366), a town so Norwegian they have a lefse factory in operation. Countryside Lefse (1101 E. Broadway, 608-989-2363) has been cranking out the potato-based sweet treat in Blair since 1965. A cheese plant also operates in the town, long known for Colby and a variety of cheese and inspiring an annual cheese festival. The city was originally named Porterville and was re-named in 1873 after John Insley Blair, an early railroad investor. 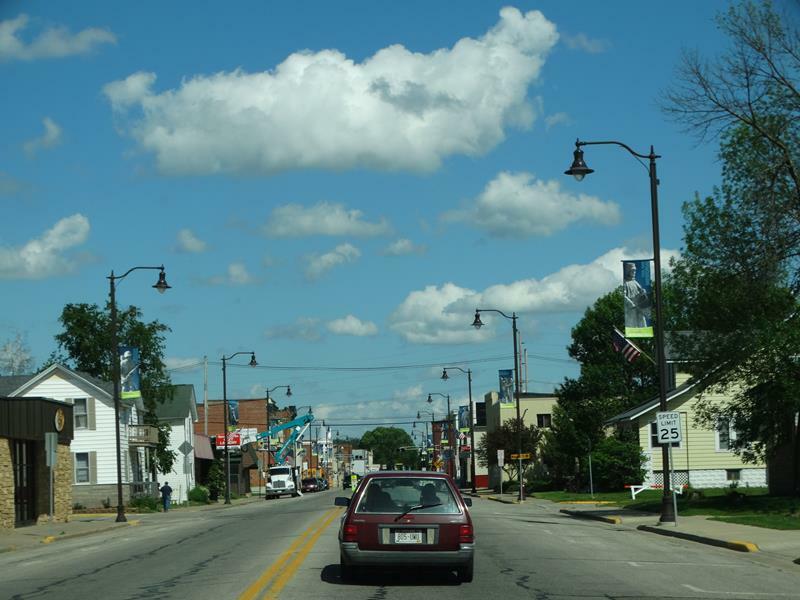 The railroad still runs through town, but Highway 95 is the main street, leaving U.S. 53 on Blair’s west side to head easterly through the heart of the city. This ride includes another crossing of the Trempealeau River and a scoot along Lake Henry, which was created from the dammed (not damned) river. 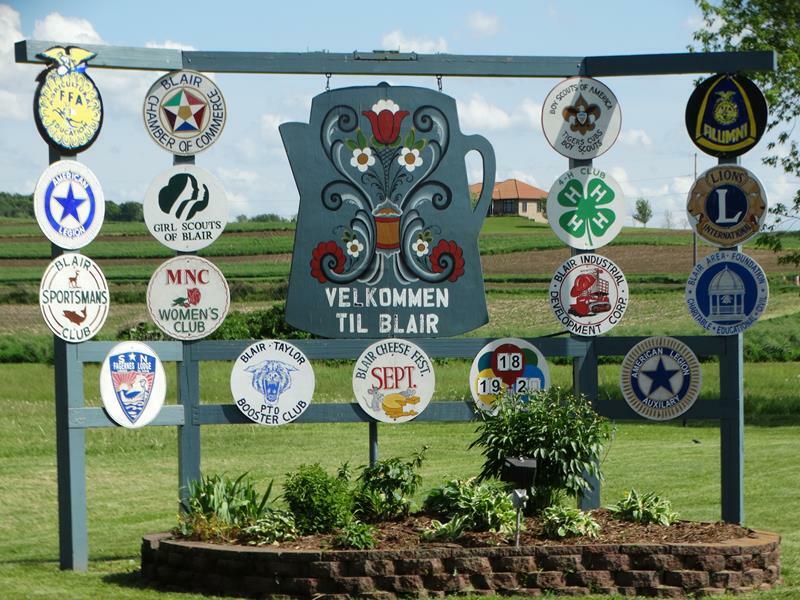 Some of Blair’s Norwegian heritage is evident on their welcome sign along U.S. 53/Highway 95. 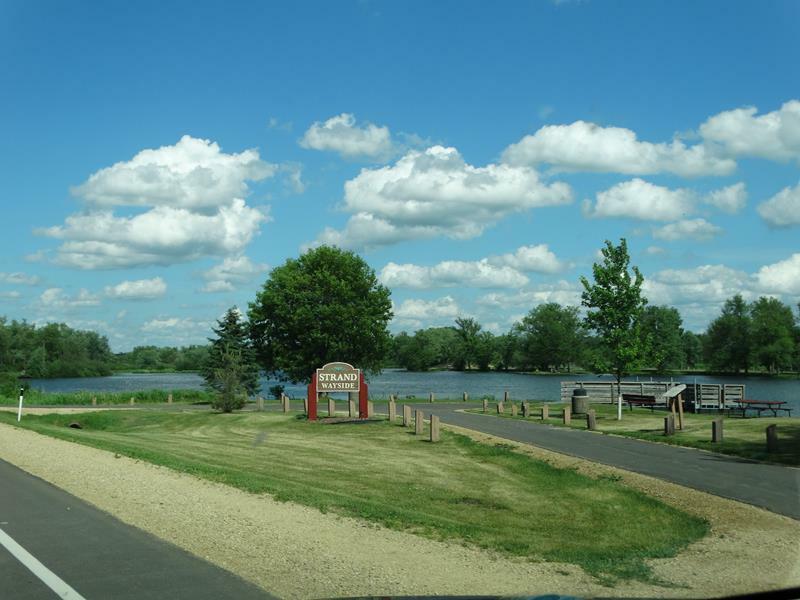 You can take a nice break at the Strand Wayside along Lake Henry, which offers a pleasant area for relaxing, having a picnic, even fishing from the wooden pier, which is also handicapped-accessible. A historical monument notes Lake Henry’s construction in 1873 to accommodate a grist mill and winter ice harvesting. Strand Wayside. Just don’t leave anybody there – that’s not what “strand” means in this case. This sight is not unusual along Highway 95, especially between Blair and Hixton. Use caution. 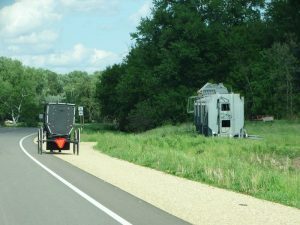 Highway 95 heads east and northeast from Blair, past more rolling hill farmland and a significant Amish community – so watch for horse-drawn wagons in the area. 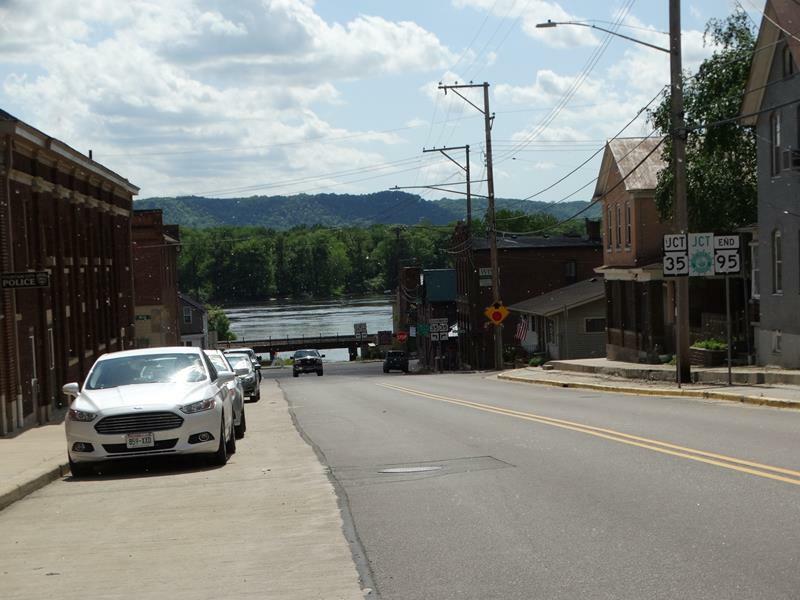 Along this ride – which continues to parallel portions of the Trempealeau River – you enter Jackson County. Before long, you ride into Hixton (pop. 433), which lies not only along the river but also just off I-94, making this the most major crossroad for Highway 95. County Roads FF and A, which cut through the center of town, were once part of Highway 27 before and for a few years after the interstate went through. I-94 was finished through this area in 1967, and Highway 95 meets it just east of Hixton. Highway 95 meets with I-94 just east of Hixton. This is roughly the halfway point of the route. Beyond Hixton and the interstate, Highway 95 heads northeast towards Silver Mound, a major archaeological site and National Historic Landmark. This unique geological outcropping consists heavily of Hixton silicified sandstone, considered a high quality, easily worked stone that was much valued by early Native Americans as a raw material for tool manufacture. Nearly 1,000 prehistoric quarry pits dot the wooded slopes of Silver Mound and scores of prehistoric encampments and workshops surround it, all right off Highway 95. Just beyond Silver Mound, but well within sight of it, Highway 95 meets up with the eastern end of Highway 121 and banks to the east into Alma Center (pop. 503), the “Strawberry Capital of Wisconsin.” The village celebrates strawberries with its annual festival in mid- to late June every year.